Oh Tiger can’t seem to get away with anything. Tiger Woods’ life has been closely chronicled since his days at Stanford including his very public breakup with his wife and subsequent melt down, his sabbatical from professional golf, his return to professional golf, and his relationship with fellow Rolex Ambassador, Lindsey Vonn. Last week, GoldCentralDaily.com picked up a conversation between Woods’ manager Mark Steinberg was picked up on the Tiger’s microphone. 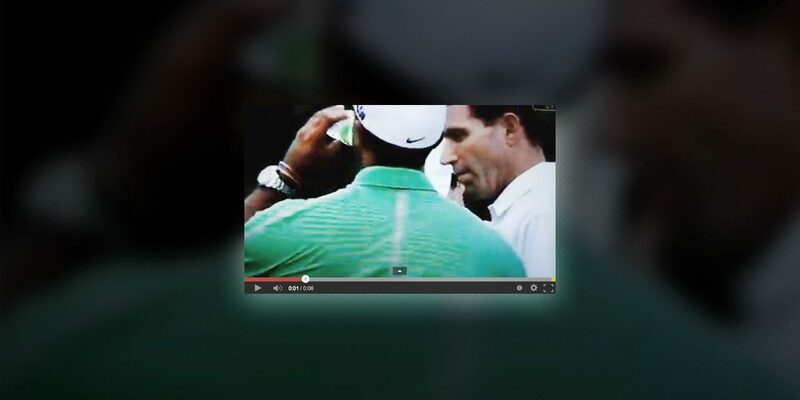 According to Golf Central Daily, Steinberg tells Woods to “make sure you prominently display that Rolex in front of Omega signs,” shedding a little insight into the high dollar endorsement industry, especially in the watch world. Part of the back-story with this Steinberg’s post round watch wearing instructions is that the Match at Mission Hills prominent and primary sponsor was Omega, Rolex’s longtime competitor for shelf space at watch dealers and competitor in COSC watch certifications. Although Rolex and Omega very rarely admit that they are competitors, they both compete for the same price points and many times are sold under the same roof. Showing a watch prominently at high media events is one of the many vehicles the watch industry uses sports to promote the myth behind their watches. Myths having a bit of truth and symbolism embedded in them are what make the story believable enough to resonate with one’s own beliefs. Subsequently, high drama and high dollar events have plenty of watch sponsors behind them such that the watch company can associate their products with the legend, symbolism, bravery and toughness that the event/sport has for the audience watching it. Rolex picks the events they sponsor very carefully weighing the metrics of the audience with whom they are trying to reach, target income level, lifestyle, and whether the provenance of the sport aligns with the beliefs of the company. This is one of the reasons why Rolex sponsors the world’s most renowned tennis tournament, Wimbledon, yet do not sponsor any poker tournaments in Las Vegas, one of the Rolex retail capitals in the world. The same is true with the people whom Rolex sponsors as ambassadors. From artists, race car drivers, explorers, skiers, and adventurers, Rolex picks carefully whom they associate their name. Sponsoring Tiger Woods after his very public meltdown was risky for Rolex. Breaking up with popular athletes after they lose the public reverence is tough, -just ask Nike and Oakley after the Lance Armstrong debacle. Tiger Woods though, despite is very public past, is a living legend in the golfing world there is no question that Rolex wants to associate with legends either living or deceased.